Duck Duck Moose, a subsidiary of the non-profit Khan Academy, is an award-winning creator of educational children’s mobile applications. 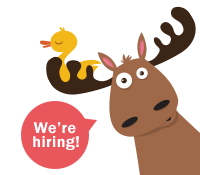 We are looking for a passionate Early Learning Writer/Author to join our team and write engaging reading material for Preschool through Kindergarten children. You will work with a small, collaborative team of engineers, product managers, and designers to create outstanding educational experiences for early learners on our new mobile product. Our ideal candidate will be an experienced writer, with teaching and/or direct experience with preschool/Kindergarten kids, who is looking to scale their impact and teach young children around the world how to read and write. Our Early Learning Writer will be responsible for writing new reading content for our early learning ELA curriculum in the form of engaging fiction and non-fiction text for early readers. This position is a part-time contract position. Ready to educate young children around the world and contribute to Khan Academy’s mission of providing a free, world-class education for anyone, anywhere! Please forward your resume and any writing samples to careers@duckduckmoose.com.